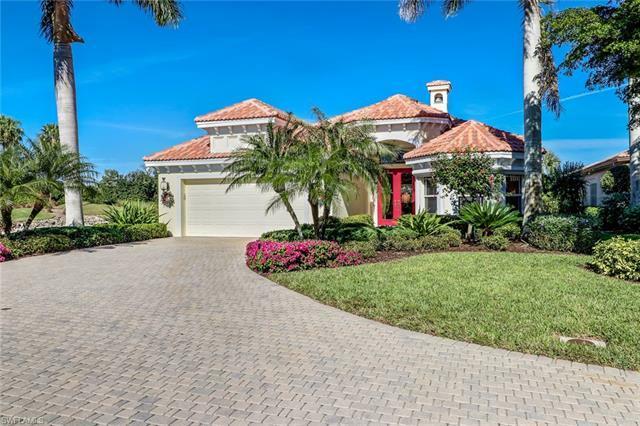 14031 Tivoli Ter, Bonita Springs, FL.| MLS# 218084144 | Southwest Florida Residential Real Estate for Sale. SKIP THE WAITING LIST! IMMEDIATE GOLF MEMBERSHIP to join one of the most highly sought after golf and country club communities in Southwest Florida. Nestled on a premium oversized lot, this custom Arthur Rutenberg Montreux III model boasts incredible panoramic golf and water views that need to be experienced in person. Enhancements include a custom fireplace and wet bar, electronic hurricane protection, new wood floors in bedrooms, additional recessed lighting, all appliances and pool heater replaced in 2013, a BRAND NEW TILE ROOF, and A/C system and water heater replaced within the last year. Palmira Country Club is a well manicured and amenity rich gated community centrally located close to shopping, entertainment, restaurants and beach access. Residents have access to the lovely Renaissance Center complete with a lagoon-style pool, olympic sized lap pool, spa, restaurant, and well equipped fitness center. Palmira Country Club also offers a 41, 000-square-foot clubhouse, dining room, grill, pro shop, billiards, very active social and tennis/pickleball program and a Gordon Lewis designed 27-hole championship golf course. Schedule your private tour today!